When the term “hitchhiking” is heard in the US, I feel it generally carries a negative connotation. Illegal on major roadways in most states, hitchhiking, or “autostop” as it is referred to in most parts of the world, paints the picture of dangerous vagabonds looking to rob or attack unsuspecting drivers. Of those that I know back home, very few would be willing to pull over and offer a seat, let alone stick out their thumb on the side of the motorway themselves. But these are only my views, and hitchhiking might be more common or accepted in certain states. However, with relatively large distances and the prevalence of mass transportation, hitching a ride isn’t the most ideal or efficient way of getting around. On the other hand, this activity is quite common in most parts of Europe, safer in some than in others. While visiting Pula, a coastal town on the tip of the Istrian peninsula, I met a fellow traveler from the UK, Sam, who, at the ripe age of 20, was a decorated hitchhiker with more than 10,000 kilometers under his belt. Impressively, he actually managed to make his way to Pula from the Netherlands by only hitchhiking. Never thinking of myself as the type to smile awkwardly on the side of the road with a thumb sticking out, slowly walking backwards while making eye contact with judging stares, I listened to my new friend’s stories and entertained the thought, but only briefly. Fast forward one week..while sitting in To Je To, my local bar/coffee shop in Split, on my last day enjoying a morning cappuccino, I was trying to decide whether to head directly to Dubrovnik or first catch a ferry to Korčula, one of the many beautiful islands off the Southern coast. Before I could make up my mind, a heavy rain began pouring down on the city, drenching the long ferry queues. It seems the choice was made for me, so I headed to the bus station. 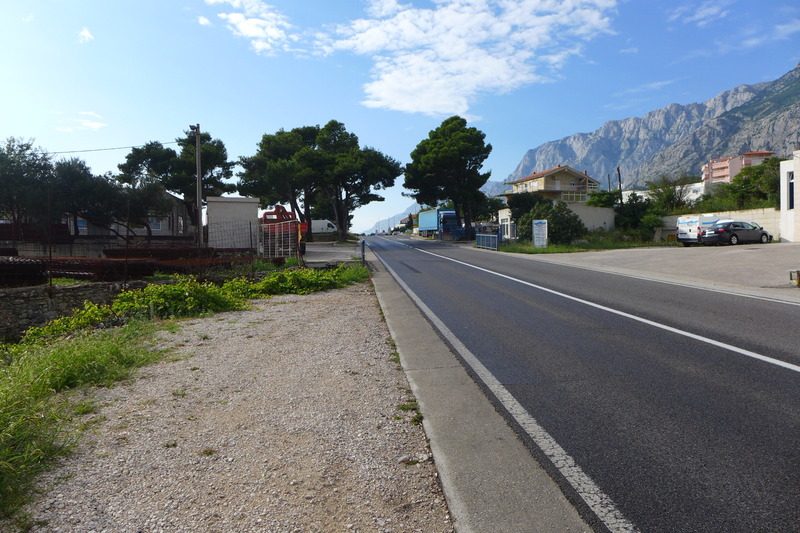 The earliest bus was to a small coastal city called Makarska, located roughly half way to Dubrovnik, and having heard good things, I was soon on my way. Makarska proved to be a popular town, and after about an hour of walking around, I realized it was a little too popular, with most places fully booked for the evening. Having already walked to the edge of town, with the bus station a few kilometers behind, my feet continued trekking away from the city center. 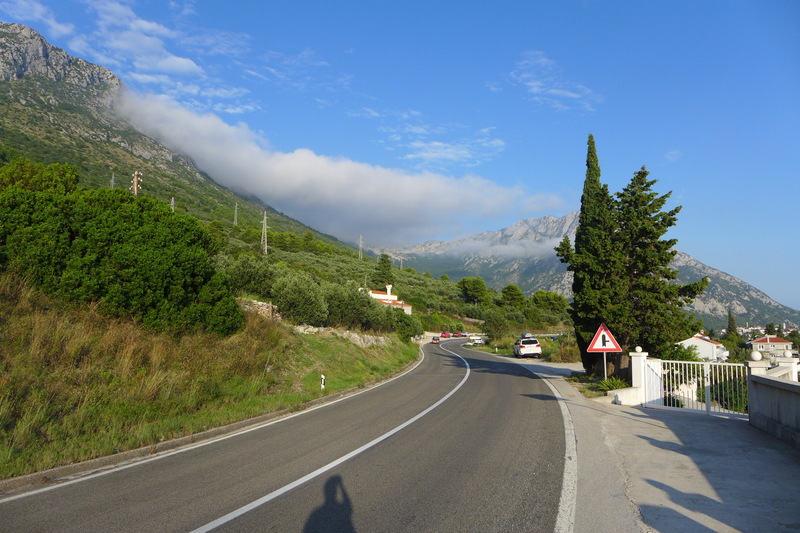 Before long, I found myself following the road signs to Dubrovnik, with a wide smile, careful backward steps, and a thumb sticking out. Sam had mentioned an in-depth, informative website for hitchhiking, the Wikipedia for hitching, if you will. There, one can find country-specific tips including optimal locations, common gestures, practices to improve success and so on. Individual hitchhikers even mark and rate specific locations on a map from which they have found rides, describing traffic flow, wait time and other useful information. Based on the general information on the site, my location choice wouldn’t exactly be considered optimal. Behind me, there was enough room for cars to stop, and plenty of space ahead for approaching drivers to spot me and consider pulling over. 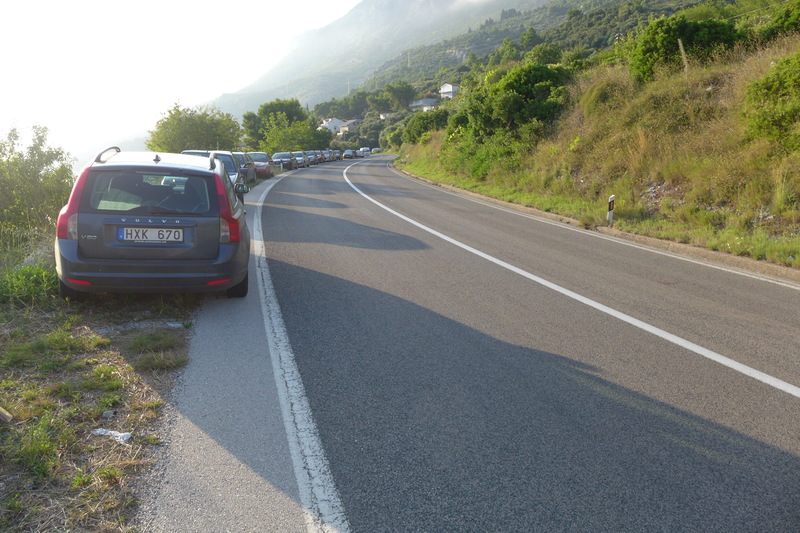 However, I was nowhere close to a motorway, decreasing my chances of finding a ride all the way to Dubrovnik (roughly 200 km away). Further, I had no sign, and it was fairly late in the afternoon, all evident red flags for hitching such a long distance. Most of the cars passing by gave me a signal, one finger pointing down, sometimes in a circular motion, which I later found out meant they were local or staying in town. Nevertheless, I tried my luck, and within 15 minutes I had my first ride. A gregarious girl in her early 20’s studying medicine in Zagreb, Neva was only going about 50 km down the coast to her small hometown of Podgora, but I figured this would be my best shot and jumped in. Although frightened by the idea of hitchhiking herself, Neva didn’t seem to have a problem picking up those in need of a ride, and I was actually her third hitcher. We had a great conversation for the 40 or so minute ride, and the drive along the coast was one of the most beautiful coastal drives I have been lucky to experience. 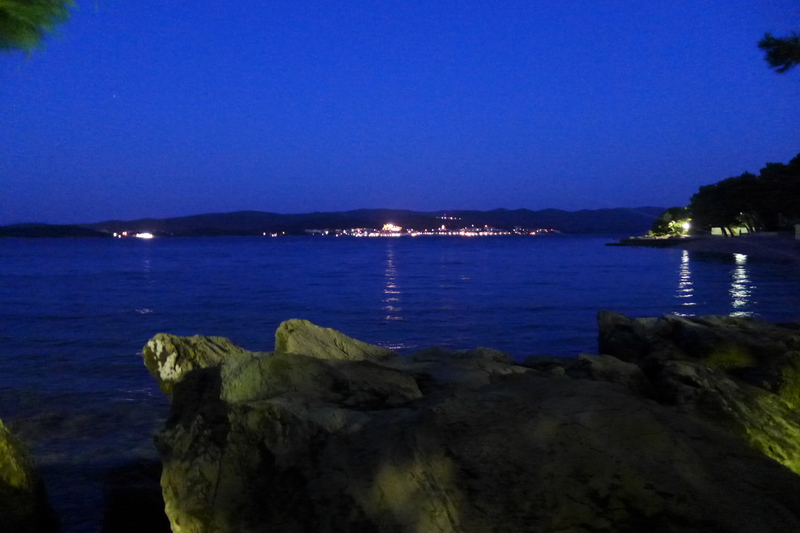 The late afternoon glistening of the Adriatic made for an unforgettable view, and before I knew it we had arrived. My new location was even worse than the first. 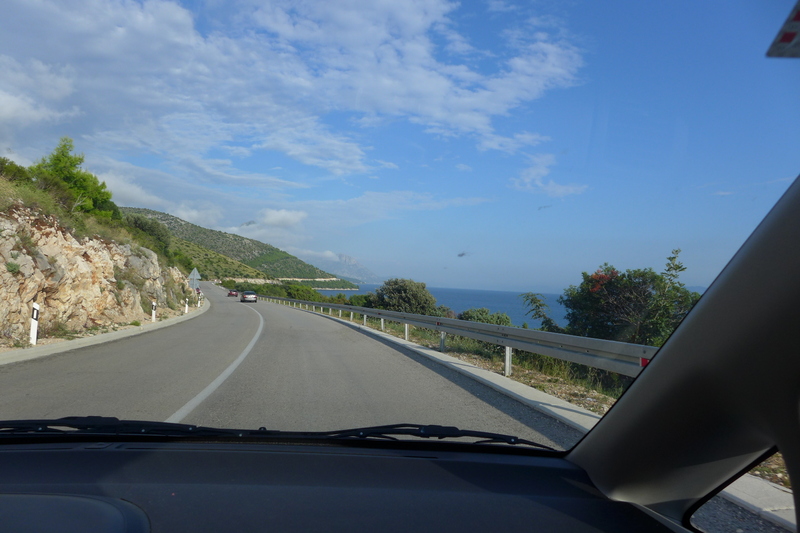 I was on a small, winding coastal road with sporadic traffic, little visibility, even less room to pull over, about two hours until sunset and almost no chance of anyone going all the way to Dubrovnik. Nevertheless, I thought I would try my luck for about an hour, after which I would look for an isolated spot to set up camp. After about 45 minutes, I saw a blinker in the distance, and a blue Volkswagen slowly came to a stop by my side. 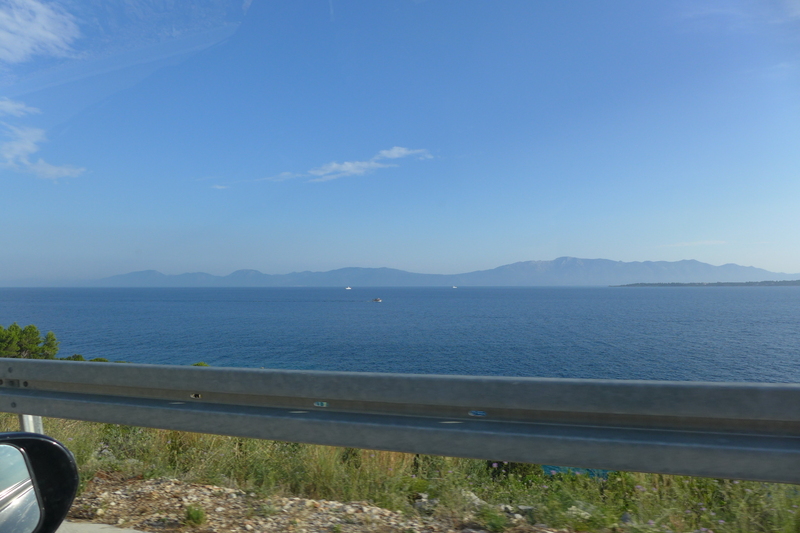 Wanting to get a little further down the coast, I agreed to go about 15 km to my new driver’s small town, Ploče. Boro, a sailor in his 30’s, turned out to be a travel enthusiast as well, most recently completing the Trans-Siberian with a few friends. 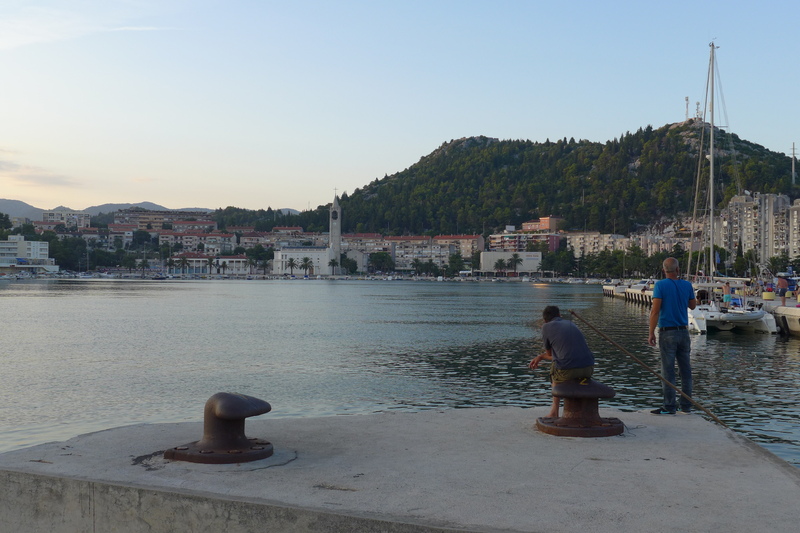 After sharing some stories, he told me that I couldn’t leave Croatia without visiting the islands, and if we weren’t too late, I could be on a ferry that night from Ploče. In the event that we didn’t make the last ferry, he was kind enough to offer to host me for the night. Taking me all the way to the pier, Boro checked the timetables and informed me that I had made the last ferry with 30 minutes to spare. Thanking him and saying goodbye, I enjoyed the sunset over the neighboring hills and waited for my ferry. The ferry ride would last about an hour, dropping me off in Trpanj, a city on the eastern side of a peninsula. 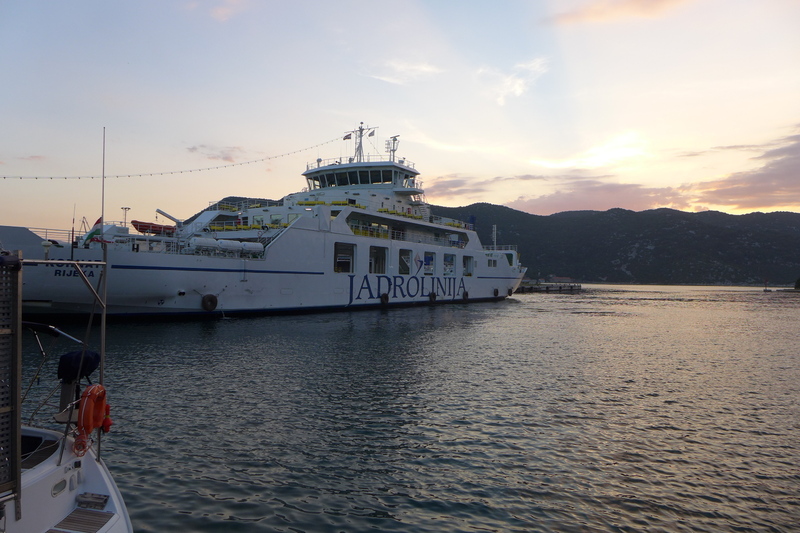 To make it to the island of Korčula, I would have to cross 27 km to the western side of the peninsula and take another ferry. Upon getting off the ferry, it would be too late to hitchhike, so I would need to find a bus or a place to stay. While trying to make up my mind, a friendly voice from my side asked if I was traveling alone. I turned to confront a group of young travelers from France. Two guys and two girls, the friendly group had just started a ten day vacation in Croatia, and after talking for a few minutes, I found out that they were heading to Korčula as well. They were nice enough to offer me a ride to the other side of the peninsula, and for the next few hours we had a lovely conversation and grabbed a bite upon reaching our destination. 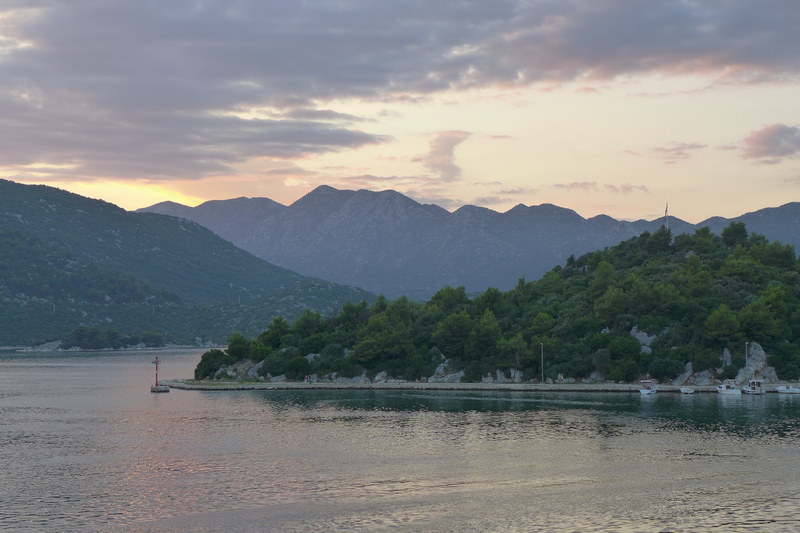 Exchanging contact information and saying goodbye, we parted ways in a town called Orebić, where I decided I would spend the night and take the morning ferry over to Korčula. 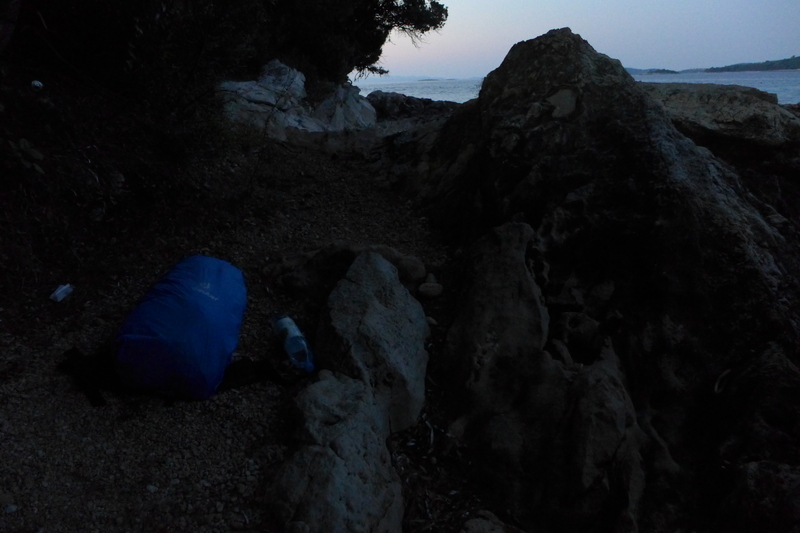 After a long walk along the beach, I found a hidden spot under a tree and between some boulders, making myself at home and admiring the crystal clear night sky. My location for the night was the perfect reward for a tiring, successful day, providing cool, mosquito-free weather right by the water and an unparalleled view. It turns out that the best things in life are truly free..
With all the hitchhiking and moving around, thank goodness you decided to travel light. 35 liters was a brilliant idea. Hey Bill, thanks for your comment and good wishes! Wherever you find very nice, local people (Colorado, Wisconsin) I think hithhiking is a safe bet, but you’re right, Chicago is a long shot :p Everyday has been quite eventful, great people along the way making it all the better! Hope all is well, send my love to Grace..Cheers from Montenegro (more hitchhiking to come! )..